This program is a module that has been added into SBT. It has its own menu, lookup tables and uses standard SBT interface conventions (button fonts, images, lookup selection behavior, etc). 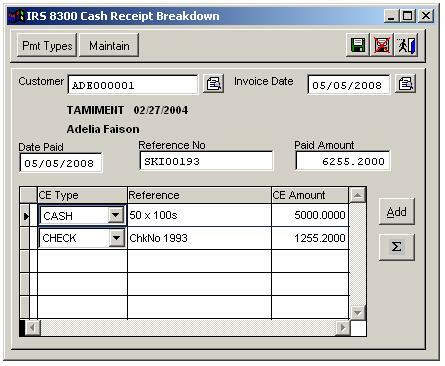 The purpose of this screen is to supplement the Accounts Receivable module to allow payments to be recorded with more detail than would normally be possible to conform to IRS guidelines for reporting payments in cash or cash equivalents. Following the posting to this screen, the totals get updated automatically to the ARCASHnn file for use within SBT.